The fluorocarbon of the refrigerative such as air conditioners more or less causes the ozone layer depletion and global warming. When the air conditioner that the repair and the compressor of the air conditioner break is abandoned, I might discharge a part of fluorocarbon. To collect this discharged fluorocarbon, I made the collection machine. This is made for the recovery of CFCs in car air conditioning with my son, my son does not seem to use it recently. This equipment has been used exclusively for me. It is a fluorocarbon collection machine that remodels the outdoor machine of the air conditioner by this photograph and made it. 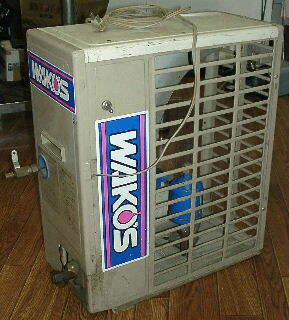 It makes it by using the compressor of the outdoor machine of a small air conditioner that became unnecessary. The thing only for not the inverter method but air-conditioning can be easily done. First of all, the inverter type is impossible. The thing necessary for others is a site glass with the filter drier and the moisture standard, the ball valves for the refrigerative, the power switches, and the codes. First of all, the capillary tube is detached. The model of the air conditioning detaches the all sides valve. The drier that has adhered originally is left just as it is. The substrate, the heat exchanger, the fan, and fan motor are removed and the exterior is cut in a suitable size. A fat copper pipe side (3/8 inches) is adjusted to the input side as shown in the photograph. It connects it with the drier that has adhered originally the compressor by installing the filter drier and the sight glass after this. A thin copper pipe (1/4 inches) is connected with the output of the compressor by the welding, and the ball valve (thing that the lever in the photograph left end adheres) for the refrigerative is installed. If the capacitor that is originally attached is installed in a suitable place, and the power switch and the code are installed, wiring is completion. The capacitor is put on the compressor for the capacitor motor and the outside is put. The inside of the self-made fluorocarbon collection machine becomes it like this. The left and blue are the filter driers. It is a site glass with the right. There is a compressor in the right side. When the site glass with viewer moisture becomes a pink color from blue detecting moisture, the filter driers are exchanged. To exchange it easily, the pipe of the filter drier is installed by the flare processing. The manifold valve is connected to the input side, and it connects it with the air conditioner that collects fluorocarbon with the pressure hose. 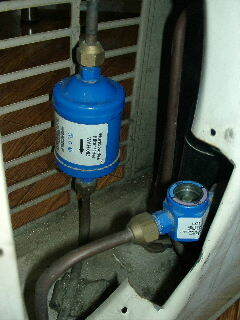 The gas cylinder for the collection is connected with the output side. Please do the air pulling out of the hose. Do not fully open manifold suddenly, it's a good little bit to recover CFCs. You will see how it were done. To put the gas cylinder on the measurement and so as not to put it in the gas cylinder too much, it collects it noting it. I am collecting it spending time while cooling the gas cylinder by the water of the bucket so that the pressure of the gas cylinder should not go up too much. Those who have no confidence in safety is not to imitate. All done at your own risk please.